Did Philippe de Chérisey know the decoding method of the Grand Parchemin? After the publication of Pierre et Papier, it was said that Philippe de Chérisey did not know the decoding method for the Grand Parchemin. His way of describing it (he was confused about the Vigenère table and the Knight's Tour) suggested the fact that he just "inherited" the Parchemin and the method of decoding it. By studying his novel Circuit (1) we can conclude that in 1971 he was very good at describing the decoding method; in its pages, the two main characters - Marie Madeleine and Charlot - are able to decipher the Grand Parchemin using the De Nègre tombstone text (De Chérisey refers to it in the novel with the symbol 1*) together with the additional 128 letters on the same parchment (De Chérisey refers to the 128 letters on the Grand Parchemin with the symbol 2*). The method described in Circuit is easier and clearer than those described by others including Franck Marie, Gérard de Sède, Henry Lincoln, Alain Feral and so on. There is a single, important problem, which soon will be clear. 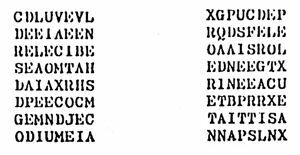 Philippe de Chérisey probably didn't use the original Vigenère table, but a modified version of it. Using this software created by me you can verify by yourself the process step by step. On Circuit this is the string 2* (click here to see it on a scan of Circuit). In Circuit this is the string 3* (click here to see it on a scan of Circuit). Here Philippe de Chérisey should have specified that the string should be reversed, but he didn't do so. I discovered the need to reverse it but the text doesn't say so. Without this step, the method doesn't work. On Circuit this is the string 1* (click here to see it on a scan of Circuit). Now the text should be written on two chess boards and read along two Knight's Tours (by starting from right one). This is, by now, the simplest process ever published, and it comes directly from the 1971 source. Philippe de Chérisey is aware of the fact that the order of the two key is irrelevant to the decoding. In Circuit we read: "It remains to apply the MORTEPEE key word to the two texts, no matter which of them". You can verify this in this article. 1.Circuit is available in the Bibliotheque Nationale de France. Its annex "L'Alibi d'O" is available on Journal of the Rennes Alchemist, Vol.II, Issue 6, June 2004, pp.35-46. English translation in Ibidem, pp.47-56. 2.They are 140, because of AD GENESARETH. 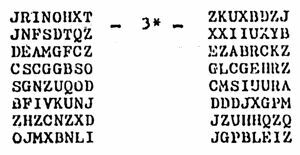 3.In Circuit De Chérisey misquoted the letters TY and wrote EA. 4.In Circuit De Chérisey misquoted the letter K and wrote N.